Remember you have a right to be safe and to be listened to and taken seriously. If you do not feel safe SPEAK TO SOMEONE who can help you. 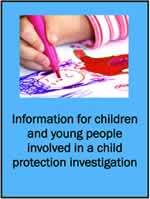 All children and young people have the right to feel safe and be protected from harm and abuse. If you are worried or need help please talk to an adult you trust, such as your mum, dad or other relative. If the person you speak to does not listen to you or does not take you seriously, or is not able to help you TALK TO US. In an emergency if you or another young person need help please contact the police or social work right away and tell whoever answers the phone that this CHILD PROTECTION and you need HELP NOW. We have a leaflet, which you can read or download here, which tells you about what happens when someone is worried about you, and social workers get involved to try to help you. The leaflet explains what happens when social workers or the police want to speak to you, and gives you numbers to call if you need someone to talk to.